‘Sideways’ Moves to La Jolla Rex Pickett’s adaptation of his bestselling novel ‘Sideways’ that debuted in May in Santa Monica, California, is moving to the La Jolla Playhouse beginning in July 2013. The play recently ended a successful run in Santa Monica on November 17, 2012. 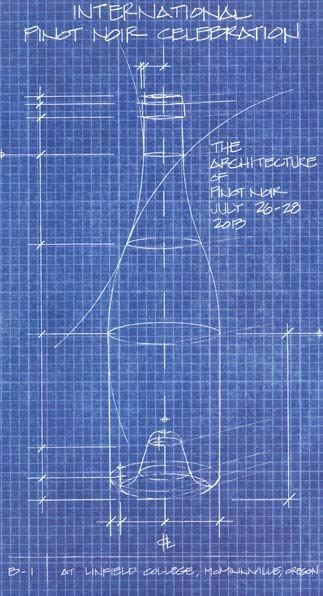 Early IPNC 2013 Information The theme of next year’s International Pinot Noir Celebration, July 26-28, 2013, is “The Architecture of Pinot Noir.” Presenters will be Eric Asimov and Terry Theise. Early bird pricing ends December 31 and local accommodations are already filling up fast. Visit www.ipnc.org. Wine Owes Plenty to the Hornet The University of Florence in Italy reported a study that showed the complexity of some of the world’s finest wines were due to the European hornet which spreads the yeast, Saccharomyces cerevisiae, to grapes while on the vine. Record 2011 Production & Sales in Oregon OregonLive.com reported that Oregon’s commercial wine industry outdistanced the rest of the United States in sales. For the first time in nearly 50 years, the $2.7 billion industry topped the two million case mark according to the 2011 Oregon Winery Census Report released by Southern Oregon University’s Southern Oregon Research Center. Total case sales were 2.2 million, topping the prior record of 1.93 million set in 2010. Overall sales increased 9 percent in both volume and revenue (far outpacing the 2 percent growth rate for wine sales national and the 5.6 percent growth rate in California). Oregon’s wineries reach 463 in number in 2011, a significant increase from 419 reported in 2010. The greatest number of new wineries appeared along the Columbia River east of Portland. Total vineyard acreage in Oregon exceeded 20,000 for the first time, and produced a record harvest of 42,033 tons. Pinot Noir Lineage According to the new book, Wine Grapes, Pinot Noir is either the child or parent of Savagnin and mated with Gouais Blanc to produce Aligoté, Chardonnay, Gamay, Melon and other varieties. If Pinot Noir is the father of Savagnin rather than the child, Pinot Noir would be the great grandparent of Cabernet Sauvignon. It also appears that Pinot Noir is a great grandparent to Syrah as a result of another offshoot of the family tree. Frank Family Vineyards Receives Accolade Connoisseurs’ Guide to California Wine published by Charles Olken, named Frank Family Vineyards “Winery of the Year.” This year marks the 20th anniversary of the winery, owned by Rich Frank. The winemaker since 2002 has been Todd Graff. The winery has over 250 acres of vineyards in Napa Valley and is most known for Napa Valley Cabernet Sauvignon and Chardonnay. The past few vintages of Pinot Noir have also been stellar. Frank Family Vineyards wines are distributed in all 50 states and online at www.frankfamilyvineyards.com. 8th Annual Pigs & Pinot Weekend Chef Charlie Palmer is bringing together notable chef pork authorities and wine elites from around the country to participate in this annual event held at Hotel Healdsburg. Participating chefs this year include Elizabeth Falkner (Krescendo), Dean Fearing (Fearing’s Restaurant), Jose Garces (Garces Group) and Craig Stoll (Delfina Restaurant Group). Gala dinner winemakers are Brian Maloney (De Loach Vineyards), Caroline Parent (Domaine A.F. Gros), Michael Browne (Kosta Browne), Lee Martinelli (Martinelli Winery) and Victor Gallegos (Sea Smoke). All net proceeds benefit Share Our Strength® and local scholarships and charities. To view the full line up of the March 22-23, 2013 weekend events visit www.hotelhealdsburg.com. Hospices de Beaune Smashes Records According to The Telegraph (December 19, 2012), the auction, now in its 152th year, saw the price of a bottle of Burgundy increase by more than 54 percent compared to last year. Total sale was 5.9 million euros. The increase was largely attributable to speculation by wealthy Asian buyers. China is now Burgundy’s fourth largest export market behind Japan, Britain and the United States, but the sales to China are still very small compared to the United States. Chinese travelers are showing up in Burgundy in small groups and minibuses. They only buy the expensive stuff. La Paulée de New York Daniel Johnnes presents this event at The Metropolitan Pavilion on March 6, 7, 8 & 9, 2013. The cuisine of Daniel Boulud, Daniel Humm, Cesar Ramirez and Michel Troisgros will be featured. This event has been described as “the greatest Bacchanalia on the face of the earth.” Growers include all the big names in Burgundy such as Maison Joseph Drounin, Domaine Dujac, Domaine Fourrier, Domaine des Comtes Lafon, Domaine Laflaive, Domaine de la Romanée-Conti and Domaine Georges Roumier. The wines of the Hospices de Beaune and the village of Meursault will also be presented. For information, visit www.lapaulee.com.